To put it simply, cubital tunnel syndrome is a condition that stems from a stretched or compressed nerve. The ulnar nerve runs in a groove found on the inner side of the elbow and is also known as the “funny bone” nerve. When compressed or stretched, symptoms can include numbness or tingling in the ring and small fingers, pain in the forearm, and/or weakness in the hand. Stretching. Keeping the elbow bent for a long time can stretch the nerve behind the elbow. This can happen easily while you sleep. Anatomy. Sometimes, the ulnar nerve does not stay in its place and snaps back and forth over a bony bump as the elbow is moved. Repeated snapping can irritate the nerve. At other times, the soft tissues over the nerve become thicker or there is an “extra” muscle over the nerve that can keep it from working correctly. Cubital tunnel syndrome can cause pain, loss of sensation, tingling, and muscular weakness in the hand and fingers. A “pins and needles” sensation is usually felt in the ring and small digits. These symptoms are typically experienced when the elbow is bent for a long period of time, such as while holding a phone or when sleeping. Some people who have this condition feel weak or clumsy with their affected hands. The first level of treatment for this condition is simply to avoid actions that cause symptoms. Wrapping a towel loosely around the elbow or wearing a splint at night to keep the elbow from bending can sometimes help. Avoiding leaning on the “funny bone” may also be beneficial. A hand therapist can help you find ways to avoid placing excessive pressure on the nerve. Sometimes, surgery may be needed to relieve the pressure on the ulnar nerve. This can involve releasing the nerve, moving the nerve to the front of the elbow, and/or removing a part of the bone. We can discuss these options together to determine what could be best for your particular case. It’s important to keep in mind that therapy is sometimes needed after surgery, and the time it takes to recover varies from patient to patient. Numbness and tingling may improve either quickly or slowly. It is also fairly normal to take many months for recovery after your procedure. You should be aware that sometimes cubital tunnel symptoms do not go completely away after surgery, especially in cases where symptoms are severe. Of course, we can only start to assess your situation and determine an appropriate treatment plan after you’ve come to see us first. 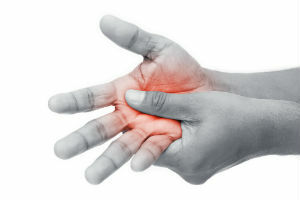 If you’re suffering from nerve pain in your hand, contact us by calling (410) 709-3868 and find out what we can do for you.